I am alright though. I'm not surprised that the Loopy Bonnet appeared on YKW - infact, I'm marginally flattered that it was noticed and has pushed me a little further 'out there'. Hey, I would have been a bit suspicious if everyone had liked it; I know my stuff isn't particuarly mainstream and that some kooky and bizzare creations do come from these hands. That's Ruth and that won't change. Yet I know it was the personal comments that was the main concern. When you've grown up being 'me', you get used to that sort of childish ridicule, and most of the time it bounces. Remarks like that from folk who don't get it aren't the main problem. It's when folk do understand, do know and still hit below the belt that the esteem takes a major tumbling. Anyhow, it's done and dusted. They've moved on to their next case and I've had my 15 minutes of fame. Now onto some fibrey goodness! The colours for Project Spectrum this month are orange and yellow. I have some orange Shetland fibre to card and spin, yet the silk is still on the bobbin and needs to be finished first. So last night I decided to tackle yellow. 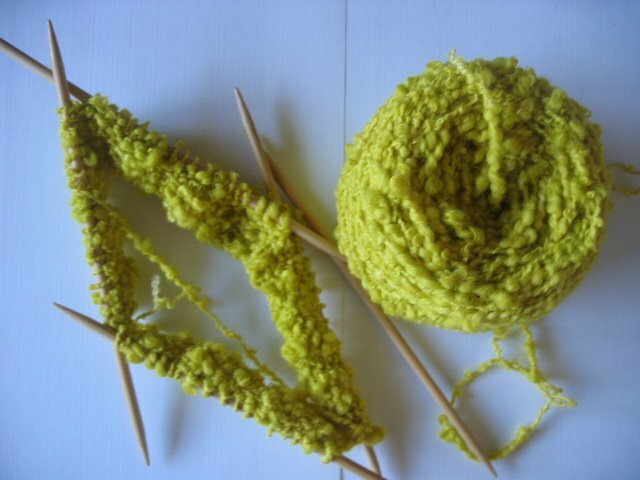 I bought this yarn deliberately for this project, knowing that me and yellow don't get on too well. 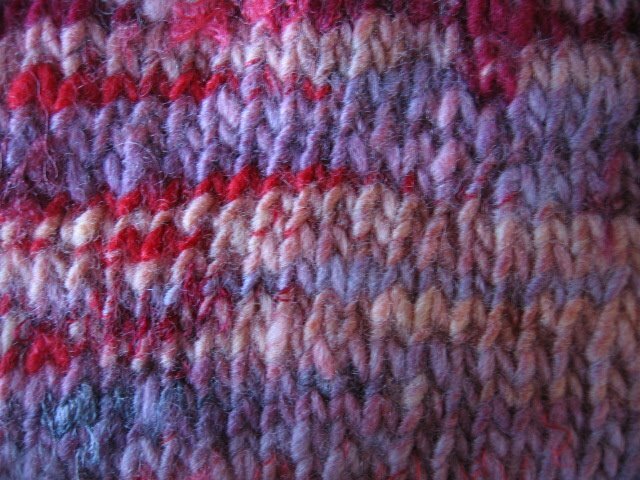 It's a hand-dyed boucle wool from handpaintedyarn.com. I wanted to challenge myself. Now, I'm having problems. Nothing creative is coming to me whilst I knit this. The orange fibre will be fine, as I can add bits in, tone the orange down a little and create a yarn that suits. Yet this is just too yellow. I think it's gonna need stripes of something... purple will contrast, but perhaps a tonal colour maybe better. I know the idea of the project is to run through the spectrum consecutively, but for me it's too close to red. Heyho. The silk needs to be finished first, so shall put this to one side until inspiration strikes. Hmm... maybe it should be skeined up and overdyed... any suggestions? Other news? Have been making a few Hats for written patterns, and one is nearly ready to go. It's a bit weird making Hats this way, for me.... if I try and sit down to design one, it doesn't work. So I've given up trying to write patterns, and will just go with the flow and see which finished creations sing to me and whether or not I can remember what I did sufficiently to write it all down. Newer:Name that songOlder:Proud to be Me!